Clipping of the nails, cleaning of the ears, aromatherapy bath, blow dry, full dematting and coat trim, refreshing spritz. * These are guideline prices only. Prices may vary based on coat condition, length, special requirements and animal behaviour. An extra charge will be added on to the base price for badly matted coats. 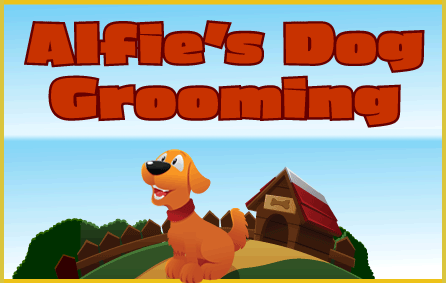 Your puppy will experience a very calm and basic groom to ease them into the process and build up their confidence. Puppies are welcome as soon as all vaccinations are completed. A pups first grooming session will depend on the individual pup; our priority is to keep your puppy as happy and stress free as possible. They will benefit from the new sights, sounds and smells of the grooming environment from an early age and become accustom to being handled and gradually get used to our equipment. With a puppies first groom it is a case of what you can do as opposed to what you want to do, many puppies first experience has a lasting impression and with a life time of grooming ahead for them a good experience is so important. On a first groom this usually includes bath, dry, nail clipping, ear cleaning and face trim where needed. Puppy grooms start at £15 and are available for all breeds. As we know when we get older we may slow down and have aches and pains and different sorts of problems well it is no different for dogs. Many of my customers are old dogs and have all sorts of problems such as skin and arthritic. Dogs like these need extra special care and we make sure they get just that. Elderly dogs are given as many breaks as they need and if a groom becomes too stressful we will end the session and reconvine another day to finish off. For any other individual treatment needs please contact us to discuss.